The Monarch® 9416 XLTM provides a quick return of investment with a printer built for maximum utilisation. If you want high quality output from multiple applications and environments, you can get it with the Monarch® 9416 XLTM compact, desktop printer. The Monarch® 9416 XLTM – A desktop printer where reliability matters. In retail, product identification and pricing are vital issues. Activities like returns, commissioning and picking have to be handled every day with the utmost precision and as efficiently as possible. In multiple printing environments like these, you want a local solution that enables you to print on demand. What you need is an easy-to-use, reliable and versatile printer to print onto a variety of supply types. The Monarch® 9416 XL™ desktop printer prints on a variety of materials: – tags, labels, receipt, paper or linerless supplies. It delivers superior prints to meet your business needs in either 1D or 2D standard barcode formats. Labels can be applied faster than usual – thanks to the standard peel mode. Variable supply sensing makes it easy to change supplies and allows printing of circular or oval labels as well as standard shaped supplies. Whatever the situation, with the Monarch® 9416 XL™ you get the output you want, whenever you want it. 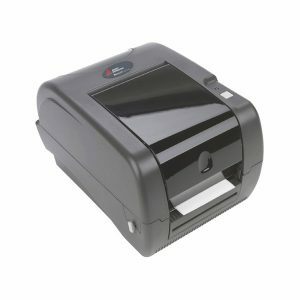 The Monarch® 9416 XL™ is very easy to operate and the versatile desktop printer fits in anywhere.. Enjoy excellent connectivity with parallel, serial and USB connections as standard, an internal Ethernet LAN adapter plus an available keyboard to develop stand-alone and mobile desktop applications. EPL works perfectly too. The Monarch® 9416 XL™ comes either as a thermal direct or thermal transfer printer and its print resolution can be optionally enhanced to 300 dpi, making it perfect for print jobs that demand high legibility. The Monarch® 9416 XLTM improves supply chain efficiency in a number of ways.